If you’re anything like me (which I imagine you are), then you can relate to the struggle that migraine and headache sufferers have with anxiety. They pretty much go hand in hand with each other. I don’t believe it’s possible to have one without the other but if I am mistaken then I would love to be proved wrong. Unfortunately there is no cure for anxiety so as migraine/headache sufferers know it’s just something that we have to learn to try to control and reduce as much as we can. That said, I know it’s easier said than done. How many times have I heard “Well maybe if you weren’t so anxious then you wouldn’t get a migraine”. Pah, that’s like saying to someone don’t think of a pink elephant….. Yep, you thought of a pink elephant didn’t you? Effectively that’s the best way I can explain it to people. As much as logically the brain is telling itself not to get anxious as it is irrational, the emotional brain overrides this and plays out the worst possible scenario over and over again, not being able to help itself. The other interesting aspect to migraines and anxiety is what comes first? The migraine/headache or the anxiety? Exactly like the chicken and the egg situation. Did the anxiety cause the migraine to start or did you become anxious about a migraine because the attack had already begun? I know, frustrating huh and to be honest it’s hard to ever truly know the answer. The best we can do is try to keep our anxiety at bay as much as possible as most migraine sufferers will know that the more anxious and upset you get the worse the pain gets, so it’s super important that we try to break this vicious cycle. So in that breath I wanted to share with you a couple of tips that I have learnt upon my healing journey that you may find helpful in reducing your anxiety. During my recovery I have always tried to push myself and step out of my comfort zone as I understand that by simply staying in my ‘safe space’ on my sofa (as nice and comfy as it is) I am never going to fully be able to get my old life back. However, sometimes I have pushed myself way, way, WAY too far with disastrous results. Like the time I flew 16 hours half way round the world to Vegas to party with my friends for our 30th birthday celebration. What the hell was I thinking? Not only did I push myself ridiculously far beyond what I could realistically achieve, it then backfired on me by smashing my confidence for months after, leaving me feel like an epic failure and super anxious to go anywhere or do anything, even if it was just down the road for a cup of tea with a friend. By knowing your limits and being realistic about where you are in your recovery, you can then use this as a positive to aid your recovery further. So for example, you step slightly out of your comfort zone, so then you only experience a small amount of anxiety that you know you can deal with, thus the experience goes well and therefore you confidence increases. Voila! You have begun to break the cycle and then the next time you are challenged to step out your comfort zone you will suffer less anxiety due to your positive past experience. Just remember friends, small consistent steps lead to long lasting changes. Now if you have never heard of mindfulness then I’m sure you are not alone. However recently mindfullness is becoming more and more recognised as a tool in treating migraine and headaches as discussed this year in The World Migraine Summit. In a nutshell, mindfulness is being in the here and now and nowhere else. Simple. It’s just bringing your thoughts and awareness back into the body and away from the worries and anxiety that you may be feeling. This is normally done by focusing on the breath by simply listening and feeling the sensation of your body breathing in and out in it’s own natural rhythm. A great way I like to practice this is that I imagine a slow following river in my mind and as a thought or worry pops into my head I simply acknowledge it and let it go, disappearing down the river into the distance. A great way to deal with anxious thoughts I find. Just let them go and come back to the breath. You see there is no possible way to feel anxious and mindful at the same time, so the mindfullness wins and as a result you feel calm and more in control. If you are interested in learning more there is a great free app for beginners called Headspace which gives you an insight into this kind of practice. Worth a go friends. 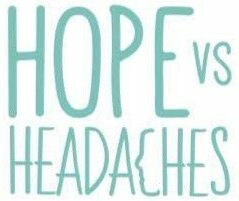 So we know that with headaches and migraines it is normally the fear of getting one that causes the anxiety in the first place, but what if we could combat this and not even give it the chance to begin? What if we had already played out the scenario in our head several times over so that we have an inner confidence in ourselves and our ability to handle a certain situation? That’s where the power of visulization comes in. Every morning I meditate and spend time seeing the upcoming events in my life, big or small, play out in my mind always resulting in the best possible outcome. I feel the feelings of joy and success throughout my body and when I return after my meditation I have this inner confidence within myself which of course naturally reduces my anxiety. Personally I use Dr Joe Dispenza’s guided mediations as I find them extremely powerful but you could just do this in a quiet space with or without music, whatever you find works for you. If you want to know more about Dr Joe’s meditations then click here to read more about the fantastic results I experienced and reduced anxiety after just eight weeks of this practice. So there we go friends, a few tips to help you with the daily battle that is anxiety, migraines and headaches. I would love to know what other ways help you deal with anxiety due to migraines or any other illness for that matter? Feel free to leave a comment below. Previous Entry Surely Prevention Is Better Than Cure, Right?